We are one stop shop. 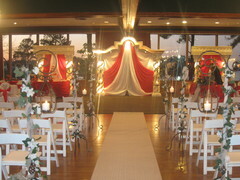 We offer everything you could possibly need for your event. From venues, to linens, flowers, dresses, tuxedos, chocolate fountain, china, waiters, caterers, cakes, limos and much more....See everyone else and then come to us because we will give you the best deal in town!! !